Published on June 15, 2010 by Wade Shepard Follow me on Twitter here. FINCA TATIN, Jungle near Livingston, Guatemala- I looked at my wife’s back the other day, I unexpectedly discovered a swollen, black, sub-dermal protrusion looking back at me. I though that it could have been the implanted larva of a human bot fly. Or at least I hoped it was the implanted larva of a human bot fly. Human bot flies live in the jungles of Guatemala and the rest of Central and South America. During their larva life stage they incubate under the skin of mammals — including humans. For six weeks a bot fly larva lives a sub-dermal existence, where it eats the skin, grows, and then eventually squirms out to become a mature fly. They are truly amazing creatures. The bot fly leaves its host while still a larva, it crawls out as a half inch long worm looking thing and falls to ground, where it embeds itself into the soil — where it will live for a couple more days before generating into a fly. Once it is a proper fly, it only has a few days to find a mate and start the cycle over again, for the adult bot fly lacks the biological equipment to eat — so it must live out the duration of its life off of the pig out it had while in the skin of its host. Once the adult finds a mate, and the female’s eggs are fertilized, the female bot fly has the additional job of capturing a mosquito or another flying insect that lands on mammals. Once captured, the bot fly sticks her eggs to it. The mosquito then finds a mammal to bite, and leaves the botfly eggs behind in the process. The deposited eggs the hatch into larva on the skin, and it then burrows beneath the surface. The cycle repeats itself all over again. Bot flies sometimes grow in the skin of humans — it is not uncommon, though it does not occur so frequently that the bot fly is considered a real pest. People don’t go around fearing bot flies here in Guatemala, no travelers requests bot fly prophylaxis before traveling into a jungle. But as I looked at the raised bump that rose out of my wife’s skin, I thought that she may have commandeered her very own pet bot fly. I made to remove the little beastie myself — or at least to determine if it was actually a larva that was sub-dermally implanted in the dorsal surface of my poor wife. Bot flies can be removed by covering the bump with nail polish, tape, or another non porous solvent or adhesive, which has the effect of making the larva come further out of the skin to breathe for air. When it does this, when the little air tube is above the surface of the skin, you can ease it out with a pair of tweezers. You do not want to kill the bot fly while it is still in the skin, as it will then become difficult to remove later. 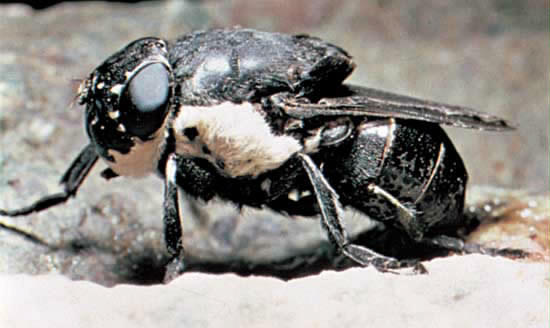 As is, the bot fly is made to come out of its host without doing it much injury — they even create a natural antiseptic to prevent infection in the temporary sub-dermal home. To kill a bot fly larva while buried in the skin is to leave a dead insect in your body, which could become very difficult to remove and cause infection. I became excited at the prospect of my wife having a botfly, I have always wanted to remove one. My wife’s “bot fly” was nothing more than an insect bite that turned into something resembling the latter stages of a blood blister. The larva was nothing more than a small sub-dermal assemblage of blood that dried up and congealed, becoming a little infected and forming a raised bump. Pretty gross, but not bot fly gross. For the record, my wife’s relief could only be matched by my own disappointment. Well that is a big bummer. I was expecting a new addition to the family and get to the end of your article and “no” Bot Fly. But I’m glad your wife was relieved. Maybe better luck in the future. Ha ha, made me laugh. Am sure your wife was not so pleased, or maybe you found the ultimate lady there and she was happy to have traveler surgery! Nasty but at the same time interesting flies those! I am hoping my wife does not find this entry — she would be really angry to see that photo of the gross thing on her back published on the internet! Chaya is real cool … but, man, not sure if she would be too pleased with me for this haha. I have to do my job though, and that means telling the story, even if that does mean publishing gross photos haha.